Early the next morning, King Altador departed for the Lost Desert. Accompanying him were two guards, a draik and a skeith. She always have a passion for violin. Music was her source of expression and being a professional violinist was always her dream. The red Pteri would play melodies for hours envisioning herself basking in the limelight on stage. However, in reality, the dream of a professional violinist is too far a fetch. In fact, the red Pteri plays the violin so horribly that the flora surrounding her tilts their bodies away from her. 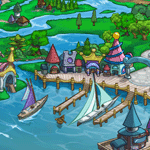 Once, she attempted to play for Neopians in Kiko Lake. The applause to welcome her on stage soon turned to disarray as she played her first note and Neopians screamed in terror, followed by a stampede to escape the concert area. Only one remained. He was JubJub. He consoled and encouraged the depressed Pteri to continue playing and this was the start of their friendship. The next day the duo would meet high up in Terror Mountains, away from the crowd and Neopians, to practice scores of music. That was disastrous at the start for avalanches were triggered from ear piercing frequencies and after many complaints from residents, they moved into a cave. Nobody knows exactly where Alien Aishas originate from, but everybody knows that they are amongst the cutest and most adventurous pets in Neopia! However, as they are not originally from Neopia, you may be at a loss as to how to properly look after your pet!